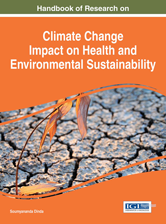 The Handbook of Research on Climate Change Impact on Health and Environmental Sustainability is an authoritative reference source that offers a comprehensive and timely analysis of various aspects of global warming and its consequences. Featuring such topics as assessment of and adaption to climate change, water and its socio-economic impact, the environmental effects of climate change on human health, and the mitigation of climate change on both a local and global level, this expansive handbook is an essential reference source. Chapter 8 What Causes Economic Losses from Natural Disasters in India? Chapter 16 Improving Sustainability of the Environment in a Changing Climate: Can REDD+ Rise to the Challenge?